At the beginning of this year, we set out to bridge the gap between Dynamics 365 App for Outlook, the future of Dynamics 365 and Outlook integration, and the legacy Outlook add-in Dynamics 365 for Outlook. We are excited to announce the latest improvements to server-side synchronization and Dynamics 365 App for Outlook as a step in that direction. 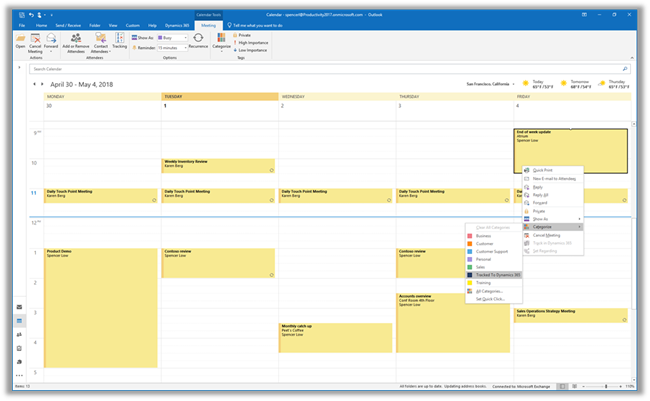 With the latest release of Dynamics 365 (online) version 8.2, we are providing the capability to track emails, appointments, and tasks in Outlook with a special Outlook category enabled through server-side synchronization. Assigning this special Outlook category to an email, appointment, or a task in Outlook will track the item to Dynamics 365. Similarly, removing the category from a tracked email, appointment, or task will untrack it in Dynamics 365. Here are some of the new features in release 8.2.2.1458. If you allow another person to manage your email and calendar by providing them delegate access, the delegate can track your emails and appointments by assigning the “Tracked to Dynamics 365” category. Select multiple emails and categorize them as “Tracked to Dynamics 365” to track them in Dynamics 365. If you want to perform other tasks like Set Regarding, use Dynamics 365 App for Outlook. 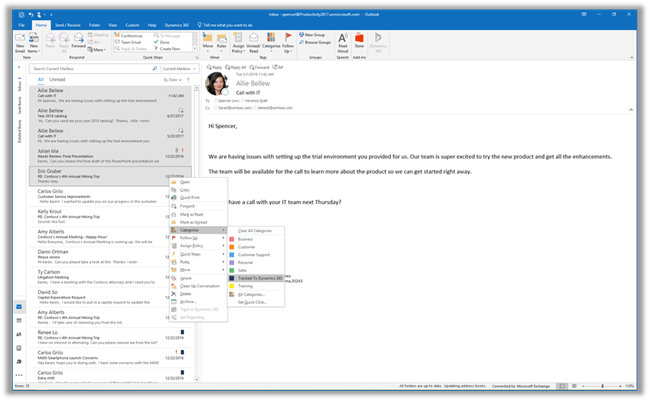 You can also set up a rule in Outlook to assign or remove category to automate category assignment. You can track your Outlook tasks to Dynamics 365 based on server-side synchronization rules by assigning the “Tracked to Dynamics 365” category in Outlook. 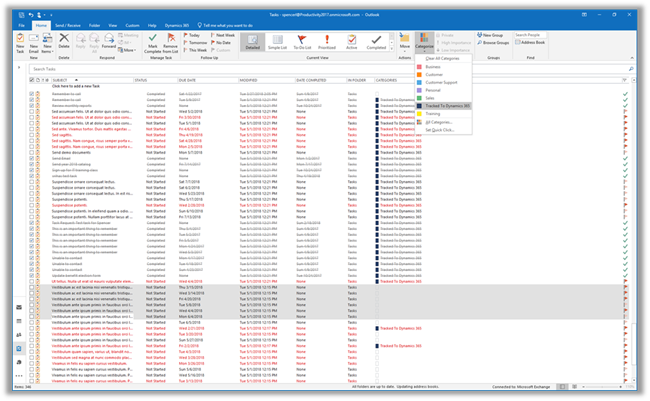 Visually identify email messages and calendar items that are tracked to Dynamics 365 by the presence of the “Tracked to Dynamics 365” Outlook category. 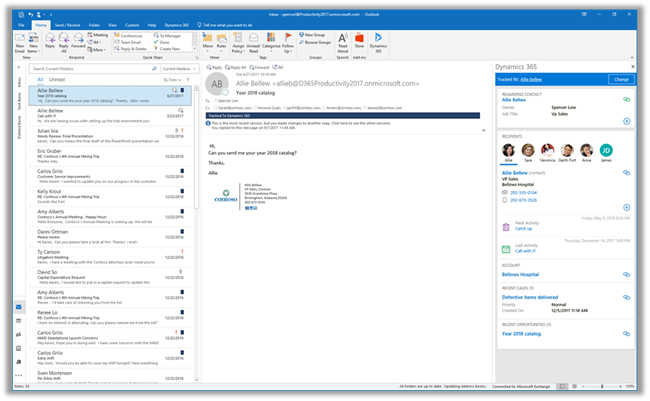 If you have Dynamics 365 App for Outlook, you can open the app to view more details on a specific email or appointment. Category-based tracking via server-side synchronization is an opt-in experience. To understand how to enable this capability for your Dynamics 365 organization, please review the documentation. This is currently available on Dynamics 365 (online) version 8.2 and version 9.0.